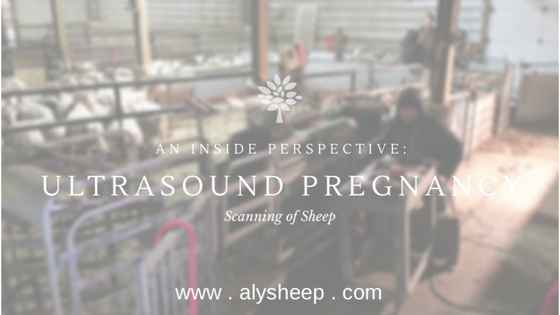 We have shared a little in the past about ultrasound pregnancy scanning our sheep. We were doing a group of 280 ewes last month and I wanted to post a little more information about it here. My goal is to share a little of my experience with you in the form of a few practical tips. 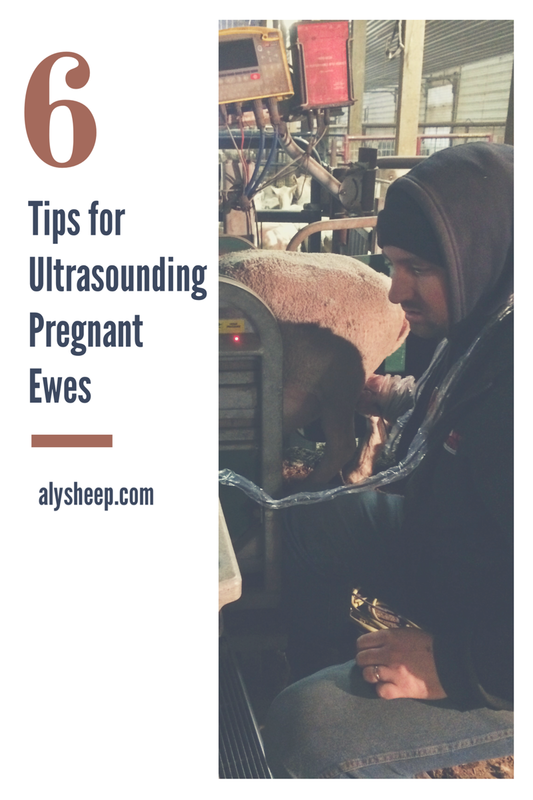 If you are interested in learning to preg-check your own sheep, hopefully this is helpful to you. Just a note on the situation here in Alberta to give context. 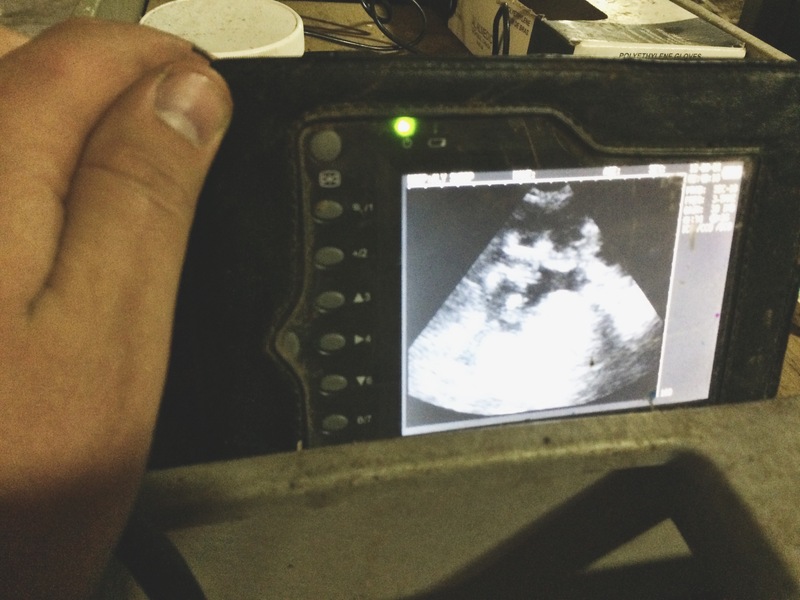 In Alberta, only veterinarians can diagnose pregnancy in sheep professionally. 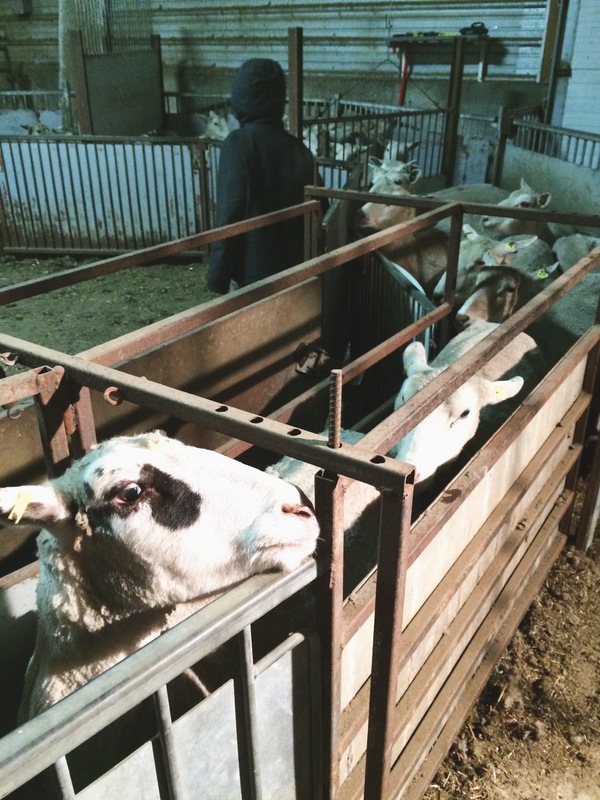 However, because of the relatively small number of sheep in this part of the world, few vets are available to perform this service, and their fees would usually be too expensive. I have also never heard of a vet that can count fetuses. 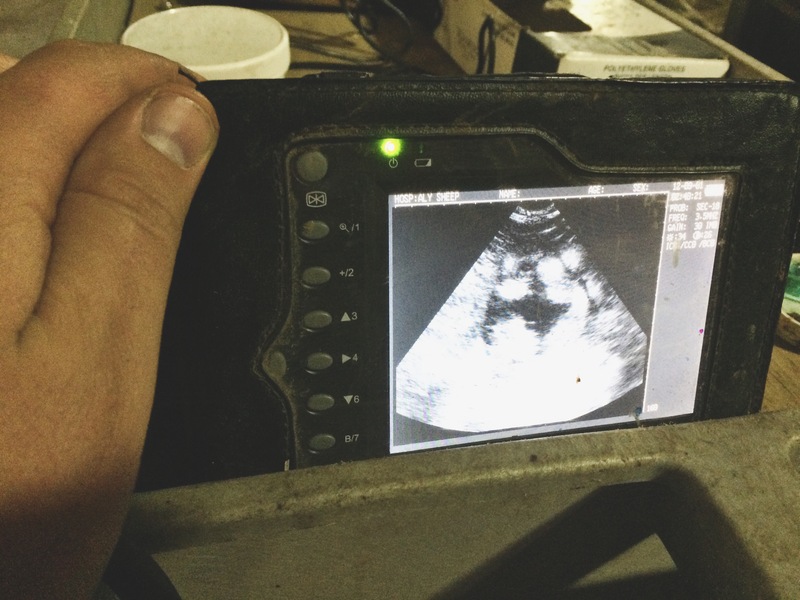 The result is that most sheep farms that are large enough are purchasing their own entry level ultrasound machines and simply checking for open ewes. That’s what I will be talking about in this post. 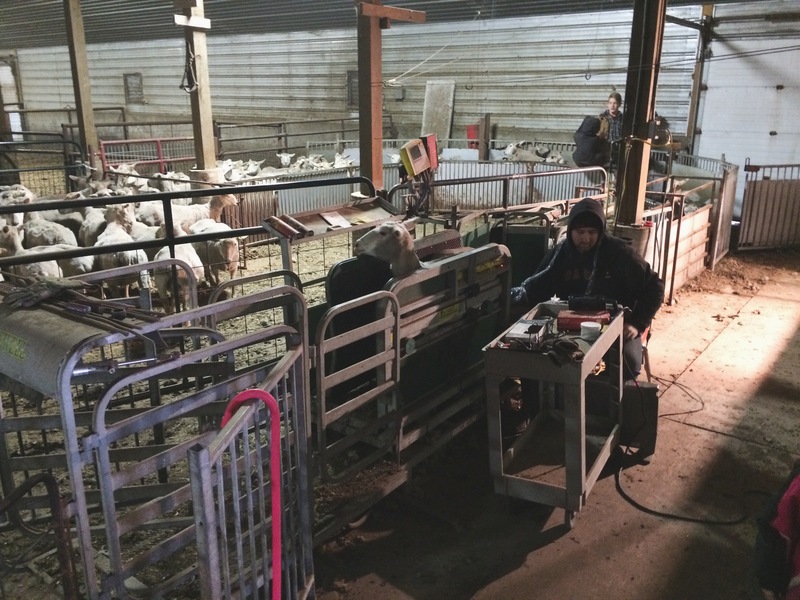 Though it would be great to be able to count lambs, there is significant enough benefit in preg checking alone to be worth the work and investment. For example, you have the benefit of being able to pull open ewes out of the group before expensive late gestation rations start. If you do multiple lambing groups you may be able to try re-breeding open ewes for a later lambing. 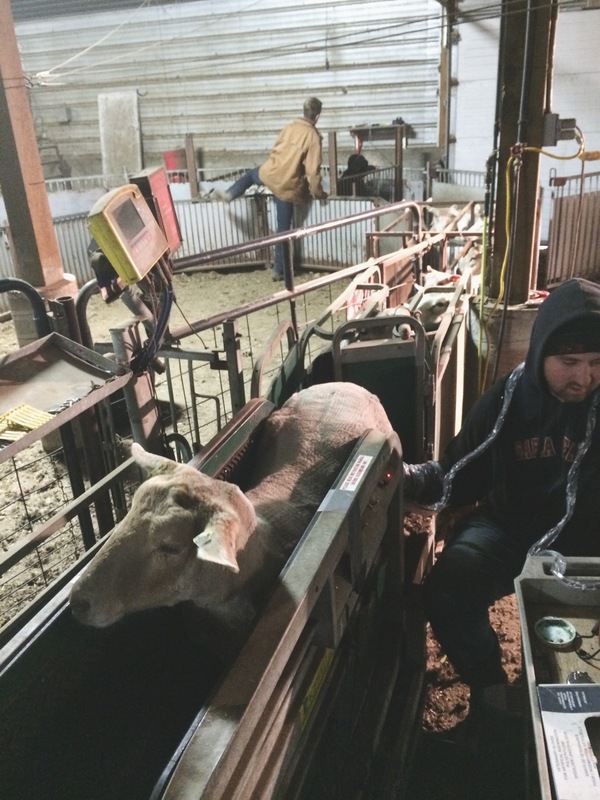 It may also allow you to make a culling decision a few months earlier than you may have otherwise. 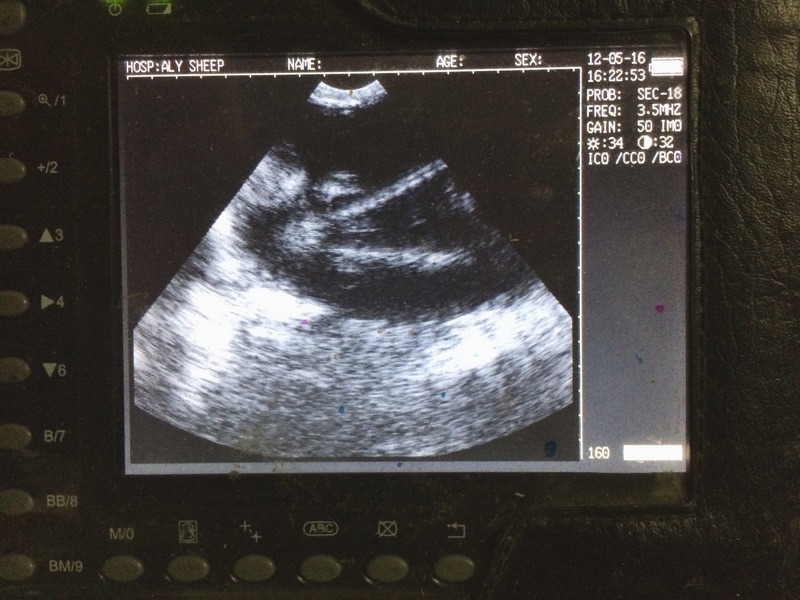 It can be especially valuable in groups of ewe lambs which typically have lower conception rates. Now for the practical tips. 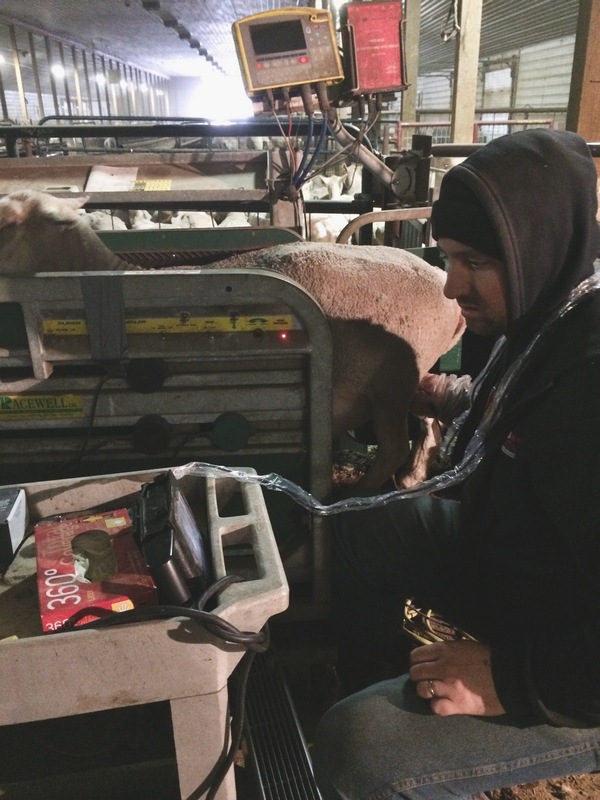 1- Make sure the ewes are off feed 24 hours before scanning. A full gut makes it more difficult to see. 2- Your arm will be right between their back legs, so you’ll want some protective gear. A vet showed me this trick. OB glove for coverage with a latex glove overtop to make it easier to use your fingers. 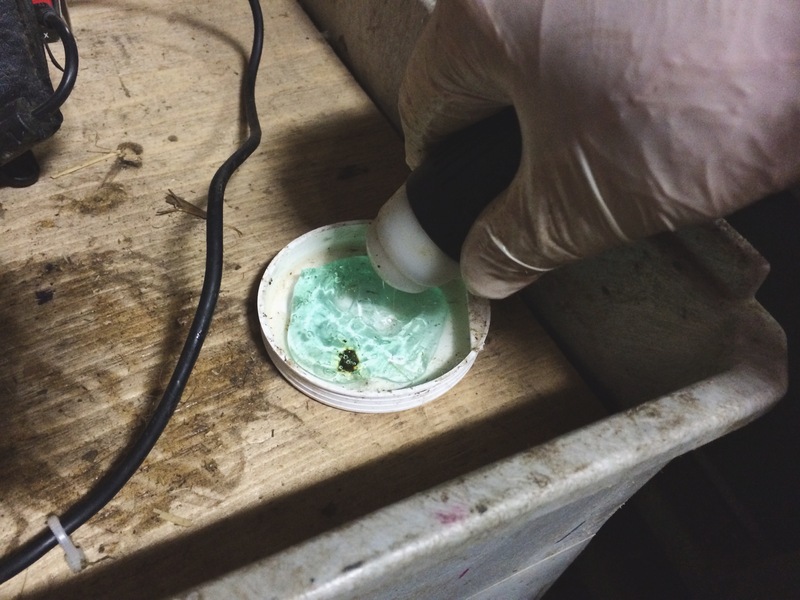 3- Put your ultrasound gel into a dish. This way you can dip your probe rather than having to squirt some on the probe every time. This is much quicker and less wasteful. It doesn’t necessarily require much gel, so use it sparingly. Too much just makes a slippery mess. 4- Some kind of working chute is preferable for more than a few ewes. I’ve worked in a chute where I had to climb in behind each ewe and kneel in the chute. It worked, but it was hard on the knees, back and shoulder. Our Racewell sheep handler is ideal. It holds the ewe elevated above floor height, so that, when I’m sitting in a chair alongside, the ewe’s belly is right at a comfortable height. You’ll see in the photos how I catch the sheep far enough back in the squeeze so that her back end is exposed. I’ve seen some chutes were the technician has a space where they can reach through the side of the chute. 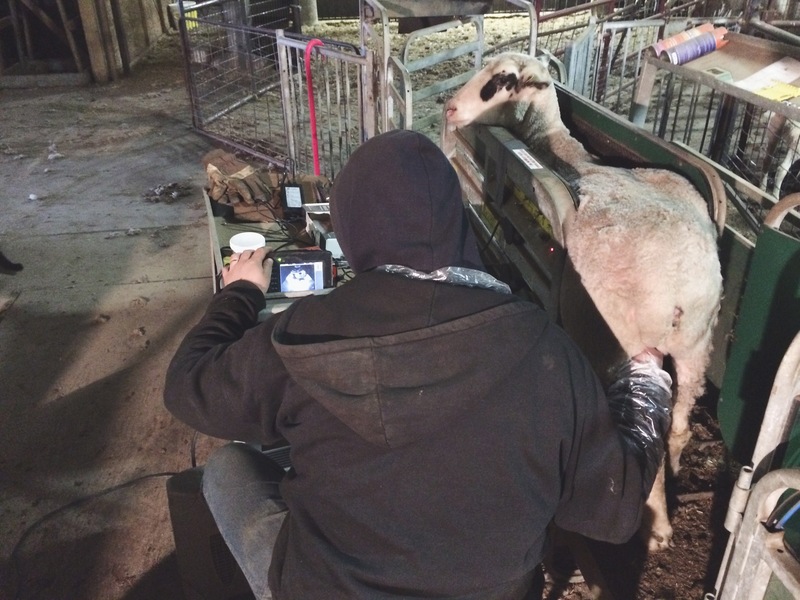 5- Place the probe on the ewes belly where you find the bare skin inside the left hind leg and beside the udder. I generally point the probe toward the spine and angled a bit forward. You’ll get the feel for where you need to be with a little practice. 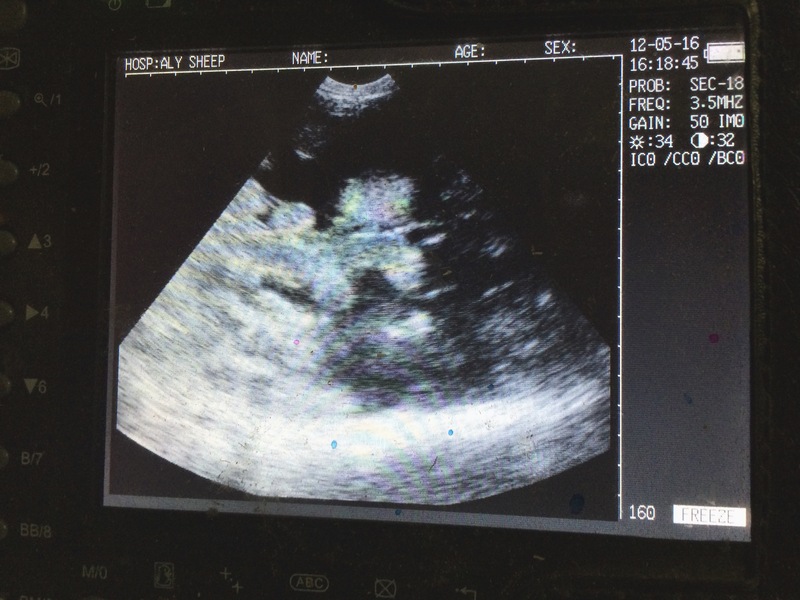 6- Pregnancy is usually very easy to detect. Take a look at some of these screen shots to see what you are looking for. If you’re not getting a clear image try using a little extra gel. 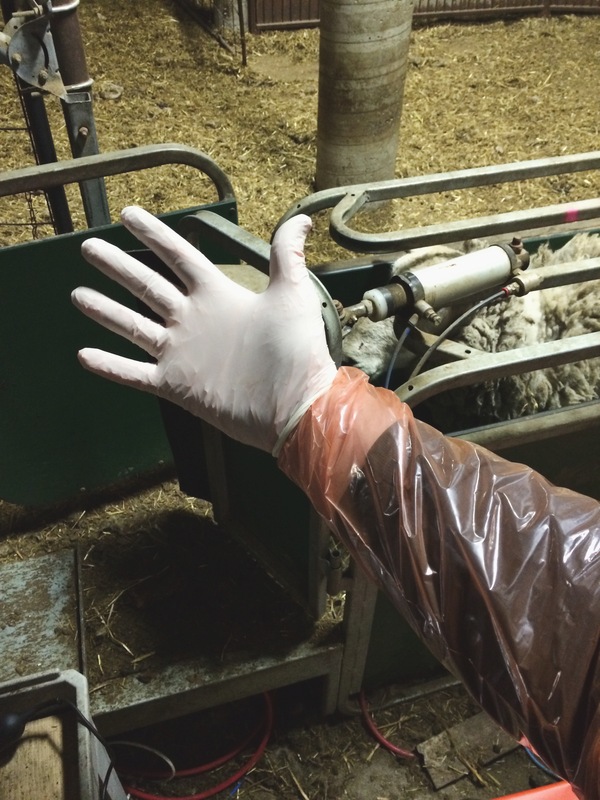 Sometimes there is a bit of buildup on the ewe’s skin that needs to be cleaned off first. There’s a lot more I could say, but I’ll leave it at that for now. If you have any questions just ask.